Huawei’s Mate 20 event is expected to bring a new smartwatch as well – the Huawei Watch GT. We saw a leaked render last week, but it was low resolution and it didn’t do the phone justice. So, here’s a much sharper version of the same image. It’s a beaut, with a dive watch style bezel and two plungers. The case is made of black ceramic and stainless steel, it’s a classic-looking watch. You can swap the 22mm watchbands to enhance the look. Huawei will reportedly offer the watch is Sport, Classic and Fashion versions. A common giveaway for smartwatches is that they tend to be chunky, but this one is “ultra-thin” - we’ll find out just how thin at the reveal on October 16. Here’s the catch – this isn’t a Wear OS watch like the Huawei Watch 2. Instead it runs a custom OS on top of a very efficient Cortex-M4 based system on a chip. ARM’s M-series has low-power processors, which combined with the relatively big 420mAh battery should offer great battery life. Up to 7 days with Always On Display active, claims the leaked info, as well as up to 20 hours with GPS on. That should be enough to track two weeks worth of running before you need to recharge it. The GT watch also packs a heart rate monitor and enough motion sensors for activity tracking (swimming, climbing, etc.). There should be an IR blaster too, an odd but potentially awesome feature on a smartwatch. There’s also 4GB of storage, so offline music should be possible (there’s no word on NFC yet). 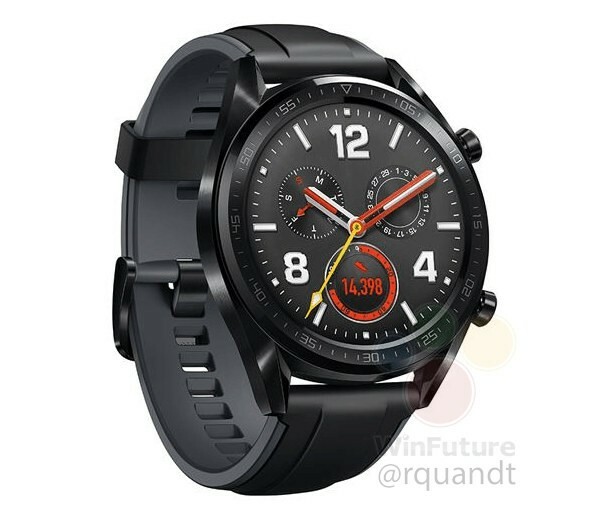 Interestingly, the Huawei Watch GT uses a brand new display – a 1.39” OLED with 454 x 454px resolution. That’s larger than the Huawei Watch 2 Pro display (1.2”) while offering the same level of sharpness (326ppi). The watch is expected to launch in Europe in the coming weeks and will cost €200. That’s less than the cheapest deals for a Huawei Watch 2 (non-Pro), but we’ll have to know more about the software platform before we can say if it’s a good deal or not – it’s all about the apps. Wear OS has them, this new platform does not (yet). Hope they can last at least a week othervise its another junk like last opieces from apple or Samsung gear.